← Learn To Love Your Lobes! Let’s have fun with some new anagrams! I just can’t get enough of these myself! These are really such fun and great for your brain! You can do these by yourself, with a group, or compete against others. Whichever way you prefer, it really doesn’t matter as long as you work that brain. By the way, have you exercised today? If not, don’t stress as the day isn’t over. Go take a walk. Medical professionals now recommend we each strive to walk 10,000 steps each day. I’ve hit mine-how about you? Everyone must incorporate some type of exercise into their life in order to achieve longevity and healthy again! Physical exercise gets the blood flowing and circulating and that’s good for your brain and brain health. I have my cup of green tea so yourself grab a cup of green tea, coffee, or hot cocoa with some spiced or plain walnuts, almonds, dark chocolate, dark chocolate covered almonds-yummy, apple slices with cinnamon, strawberries, or blueberries and let’s workout. Remember, anagrams are a great brain exercise and they target problem solving skills, reasoning skills, thought organization, thought flexibility, judgment, and executive function skills. 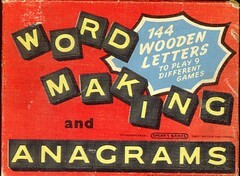 Anagrams are fun for everyone-teens, baby boomers, seniors. Anagrams are a fun brain building anti-aging activity to boost those brain cells, help form new neural pathways, and build your cognitive reserve. Try these anagrams as a family activity or part of a family game night, compete against friends or office co-workers and see who can find the most. Enjoy, laugh, have fun-it’s good for all of us! Did you know that a healthy heart helps us maintain a healthy mind and brain? Amazing, isn’t it? Posted on February 10, 2011, in Ageing, Aging, Alzheimer's, Alzheimer's Disease, Anti Alzheimer's, Anti Alzheimer's Disease, anti-aging, baby boomer, Baby Boomer Activities, baby boomers, Baby Boomers Activities, Brain, brain challenges, brain fitness, Brain Food, Brain Foods, brain games, brain health, Brain Maintenance, Brain Plasticity, brain teasers, brain training, breathing, breathing techniques, Build Brain Power, cognition, cognitive health, cognitive reserve, cognitive skills development, cognitive training, Dementia, executive function, executive functions, exercise, FAMILY ACTIVITIES, FAMILY GAMES, Games, grey matter, health, health and wellness, Health benefits of spices, Healthy Aging, Healthy Eating, healthy heart, Healthy Living, Healthy spices, heart, Improve brain function, Improve Memory, Improve Thinking Skills, judgement, judgment, learning, lifelong learning, Longevity, memory, memory exercise, memory exercises, Memory Loss, memory training, mental exercise, Mental fitness, Mental Stimulation, mind challenges, mind fitness, mind games, neuroplasticity, Prevent Memory Loss, problem solving, processing speed, puzzles, reasoning, Sandwich Generation, Senior Activities, Senior Fitness, senior health, Spices, Spices for brain health, Spices to promote brain health, stress, Stress Management, Stress Reduction, stress relief, thought flexibility, THOUGHT FORMULATION, thought organization, Word Games, word play, Word Puzzles and tagged Ageing, Alzheimer's disease, Anagram, Anti Alzheimer's, Anti Alzheimer's Disease, anti-aging, Baby boomer, baby boomers, Blood pressure, brain, brain fitness, brain health, brain plasticity, Cognition, cognitive reserve, Conditions and Diseases, Cryptic crossword, dark chocolate, Dementia, executive function, Executive functions, Family activities, Family activity, Family Games, Fitness, Grey matter, health, health and wellness, healthy aging, Healthy diet, Heart disease, Humor, Hypertension, judgment, longevity, memory, Memory Loss, mental fitness, mental stimulation, Neurological Disorders, neuroplasticity, Olive oil, Omega-3 fatty acid, Physical exercise, Prevent Memory Loss, problem solving, Recreation, Scrabble, Senior Fitness, senior health, Stress, Stress management, Walnut, Word game, Word Games, word play, Word Puzzles, Wordplay. Bookmark the permalink. 1 Comment.